The Autumn Blaze maple tree is a hybrid species comprised of half red maple and half silver maple. The combination has been popular for 20 years in commercial and residential plantings thanks to the combination of gorgeous fall color and rapid growth - exactly what homeowners are seeking. In addition, the Autumn Blaze is very hardy and can withstand a wide range of climatic conditions. The big drawback of the Autumn Blaze maple is its structural weakness. The tree tends to crack easily at branch unions, which leads to broken branches and property damage after even mild storms. To avoid problems with Autumn Blaze maple trees, property owners must invest in regular tree care. Maintaining autumn blaze maples requires regular pruning every 3 to 5 years. Regular pruning helps keep the structure of the tree sound and prevent some of the issues discussed/illustrated below. I planted an Autumn Blaze at my parent’s house 15 years ago and I prune it every year! My dad is always amazed at how much wood I remove from the tree on a yearly basis. The two major maintenance issues for this tree deal with the roots and the canopy. For a discussion on roots and root zones check out some of our other blogs related to that topic. We will discuss canopy management below. If an Autumn Blaze maple tree has been in your landscape for more than five to tens years without any structural or upper canopy pruning, please contact a certified arborist ASAP because these trees require regular pruning. I’m not exaggerating here, they really do need regular care in order to stay in your landscape long-term. Unmaintained trees develop weak branch attachments (cracks) prone to failure, which ultimately can mean losing the entire tree. The lowest branches on this tree have strong, circular, horizontal unions. Past the first few limbs (at left), this tree's unions are deep, vertically-oriented V's. Notice how every union has a vertical crack extending down from the bottom point of the branch union? This is trouble waiting to happen. This blog features a 14” diameter Autumn Blaze maple that has been growing for 15+ years (see below photos). Since the upper canopy has never been pruned, all its major branch unions (where they connect to the trunk) have developed significant cracks due to included bark. Included bark is bark wedged between a v-shaped branch union of co-dominant stems. In the photos above, the lower branches have strong open unions, while the upper branches that look like v's have included bark. These are branches are most susceptible to high-wind branch failure, also know as sail effect. So this tree needs some extra TLC in the form of dynamic support cables. The cables provide extra support for the weak v-shaped branch unions that are synonymous with Autumn Blaze maple trees. With this particular tree we will reduce (shorten) branches competing with the central trunk in order to encourage the central trunk or leader to assume the dominant position in the tree (see below photos). By reducing competing leaders you minimize the risk of branch failure and redirect energy from those branches by removing live tissue. Before pruning. Notice there is no clear central trunk. After pruning. Reduction cuts have significantly decreased leaf load in the entire tree and limited competition for leaders, encouraging the central trunk to become clear and dominant. Can you believe this much pruned wood came out of this Autumn Blaze? It's difficult to tell from the before-and-after, but it's a lot of wood! This tree is very consistent in terms of (poor) form; without regular pruning from the time of planting it is almost certain to have structural problems. 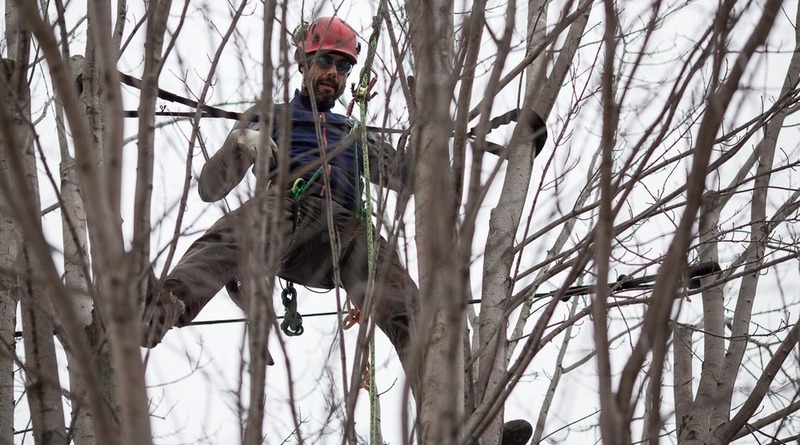 Because this tree had not been previously pruned, it requires more than just pruning; dynamic support cables will be necessary to provide extra support for the weak unions described above. These support cables are permanent fixtures in the tree. Please read Support Systems for more information on dynamic cabling. Brent adds two dynamic support cables in this Autumn Blaze maple tree to help prevent the trunks from cracking under leaf and wind stresses. The dynamic cables are placed in the upper canopy and are not very noticeable from the ground. They will provide added support for the tree making it more likely to withstand heavy weather events throughout the year. Now that the tree is pruned and the cables are installed it you can enjoy its ever-expanding shade and wonderful fall color.